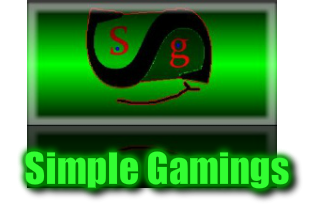 Simplegamings was made so that the general public could know about and be educated on what a video game is, how it works, how to make one, and also to provide clean games for every one to play. Creating the physics with letters and symbols. As the world is created with the beauty of art. And enthusiasm is generated with sound effects of variety. Space and time are developed with perfect design. And you step back to see your creation. This... is why I make video games. This... is what I love. Well, we do 2 things, we provide free games, desktop backgrouds, information, and guidance in where to go for more info, games, programs, and so on for the general public, and we get game development teams, organizations, and companies on their feet and give them what they need. How do we do that? Through our community "Game development",Our community provides up dates on the development of our games and is a place where 200 people, developers, bloggers, companies, teams, and organizations share what's going on, what they need, if they are looking for workers, and games of their own. Educate you on game development, bring you in contact with other developers, let you know what games are coming out, and give you what you need to start a team, org, or a company as well as answer questions that you have. This website however gives you free games, and information to help you understand, play, and develop video games, but not just any games, clean games with no mature content or anything rated more then E for every one. So join us on the website or community in developing video games with imagination. Is that all that we do? No, that is not all that we do. Out side of the website (mostly in the community) we lend a helping hand. We answer questions from students about what degrees to take, what to pursue and what to not worry about. We help spread the word of organizations and game development teams through social media and sometimes this website, and with their permission/asking we find sound engineers, programmers, 3D modelers, animators and more to join their company, indie team, or organization. We also help bloggers with writing articles. We recommend games that are coming out by teams that we know or ask like SOMPOM studio's Brain Square. This is an awesome brain twisting game available for android that we talk about in our "what's up" page. So you see, we don't just provide free games, information, and news. We try to do our best to help everyone we can to do what they love. So don't be shy, if you have a question or request please contact us in the "contact SG" page under "about SG". We hope you understand us more and look forward to your questions! OBJECTIVE....... WE WANT KIDS TO ENJOY THE ART AND SCIENCE OF GAME DEVELOPMENT. THE GOAL. TO HELP, INSPIRE, AND CONTINUE THE GROWTH OF NEW DEVELOPERS.